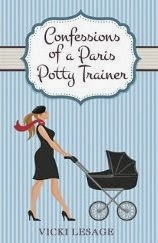 My review today is for Confessions of a Paris Potty Trainer by Vicki Lesage. This book continues on from her first memoir about her life in Paris, Confessions of a Paris Party Girl . Vicki is just an ordinary woman writing about her life in Paris, but her writing is engaging and entertaining and I recommend you start at the beginning. You can read my review of book one here. This book shows the same sharp sense of humour and fun outlook on life that I enjoyed in the first book, but gone are her party days and hilarious look at some of the frustrations of French life. Instead she ‘tastefully’ turns her attention to describing with wit the various occasions when she’s to be found naked, with her legs in stirrups on an examination table and how to cope becoming a parent in France. She still has plenty to say about (and to) commuters on the Metro and travellers at the airport, but when it comes to talking about her husband and babies her soft side comes out. Paris life, including moving apartments, getting a place in a crèche, becoming part of a local community and registering her son at the US Embassy (where he was given his own flag) are described in just the right amount of detail to keep the story moving nicely along. Despite the fun and engaging way she writes about her life, on a serious note I know that giving birth isn’t easy, so to do so abroad, with complications, must be scary. This book should reassure those in a similar situation that even when things aren’t textbook perfect, with a positive attitude they will get through it. I am sure many of the experiences she writes about must have been very emotional and painful at the time and the fact that she can recount them with such honesty and make them entertaining enough to raise a smile is quite incredible - more so, when many of these events only happened earlier on this year. This is a self-published book, but Vicki has sensibly got a great cover designed for her, a keen eyed editor and an author friend to help, all of which ensures it is a book worth reading. Having now read and enjoyed both of her memoirs and her blog, she comes across as hyper organised and always in control, so I can’t imagine her ever settling for anything other than total perfection. This shows in the quality of the book. It has been a privilege to read about the first years of their Franco/American family life and I wish them all the best for the future. Both of Vicki’s books are available in ebook and paperback format and links to Amazon are below.